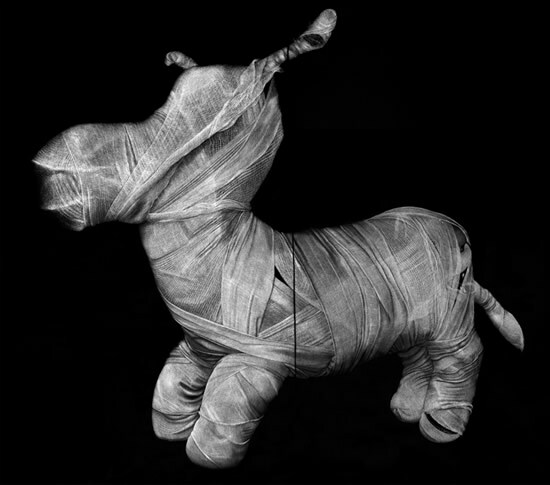 Adeel uz Zafar's minutely detailed, large-scale images of bandaged toys are not only central to a new wave of contemporary talent in his native Pakistan, they're increasingly acclaimed elsewhere. Uz Zafar's works are created using a scalpel to carve into the surface of exposed photographic paper (or, in more recent pieces, vinyl). This technique, which merges the disciplines of engraving and drawing, was developed while the artist was working in a remote area of northern Pakistan where conventional mediums were difficult to acquire. 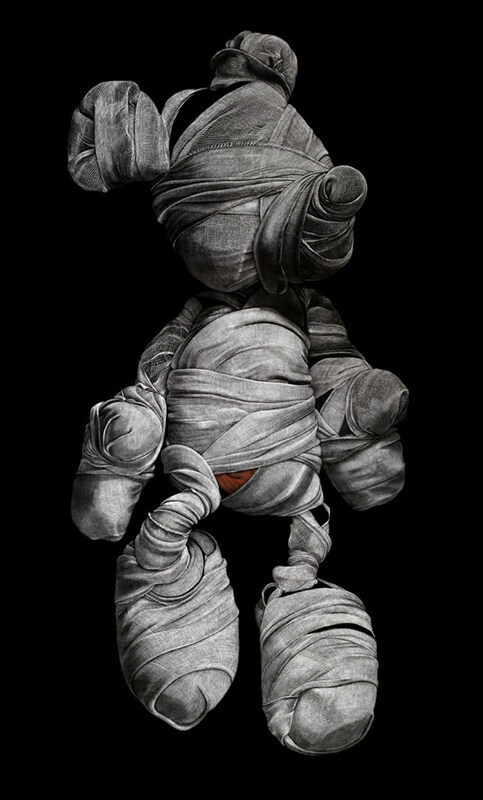 As for his subject matter, Uz Zafar cites a previous career as a children's book illustrator as an obvious influence, while also highlighting the poignant - and not always straightforward - symbolism of his bandaged toys. 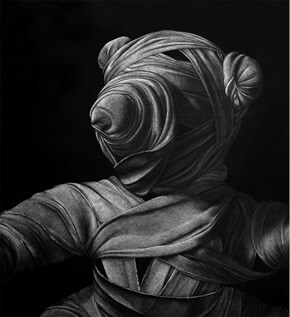 Reflecting, on the one hand, "the innocence of childhood and a primeval need for security", the mummy-like wrappings also clearly suggest something that is ".. broken or wounded and requires repair. The idea points to a loss of innocence and to the disintegration of (Pakistan's) socio-political framework." There's also more tangential - though no less incisive - critique of exactly the kind of nostalgia such childhood playthings are often designed to evoke. "Mickey Mouse, who is traditionally adorable and lovable, is shrouded and mysterious almost like a disguise because his intention is to enter children's homes and ensure that he becomes a central figure in their lives. The idea is that multinational corporations creep into our childhood associations and embed themselves there so that the merchandising never stops."